The World Boardgaming Championship takes place all this week in Lancaster, PA. I hope to see you at the Lancaster Host Resort for some gaming. If you would like to know more about this event, check out the Boardgame Players Association website for information about the WBC. The Dominion tournament at WBC continues to draw huge crowds as one of the most popular events for non-collectible card games. If you plan on playing in this event, you need to learn the format ahead of time. This single elimination tournament will only use Kingdom cards from Intrigue for the first two rounds, so your survival depends on your ability to play with these cards. What cards should you look out for in this format? Limited only to the Intrigue expansion, this card earns a higher ranking than usual. 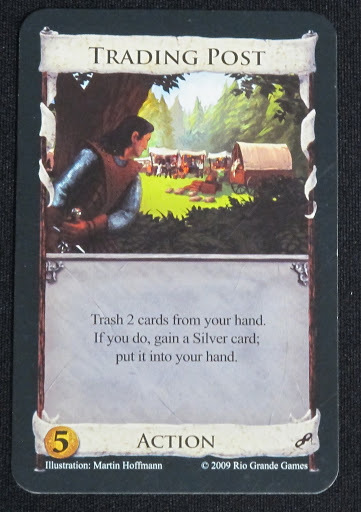 The potential Kingdom set up could benefit a player from adding this card to his or her deck with all the split action cards in Intrigue. 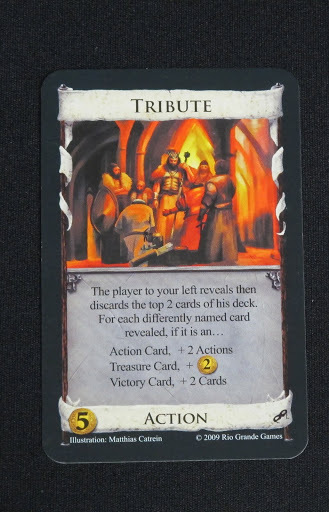 If players begin to build Scout decks or buy Nobles just as a Draw/Action engine, Tribute will feel like a Grand Market. This card depends on a lot going right and might not deserve a spot on the list compared to other cards; however, in this format you should reconsider its power level. Almost every deck will benefit from a Pawn. The biggest advantage comes from how the modes keep this card relevant regardless of the game state. Early on it helps draw cards and or provide actions, but later in the game it can provide an extra buy if you really start producing a lot of money. Do not over extend on purchasing this card. Playing several Pawns in a row just tortures everyone for wasting time, because you still will just end on one terminal. Unlike Ascension not every card adds points to your score. Smithy is good. Smithy is better when all your opponents must discard two cards or take Curses. This terminal can do a lot of damage. Torturer does not give your opponents any good options unless they possess trash effects. Torturer’s power level diminishes in this format because of several cards deal with Curses. Do not avoid a Curse strategy. Certain boards will allow this to succeed; however, even a mediocre card like Upgrade can mitigate the power of Torturer. 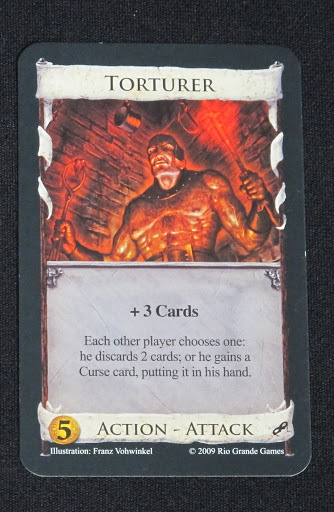 Actions that trash make Torturer essentially just a Smithy, so seek out cards that provide multiple actions. Multiple actions allow for more card drawing and you distribute more Curses. More than one Torturer can create a situation where most trash effects cannot keep up. Need to juice up the power of Torturer, Shanty Town does the trick. 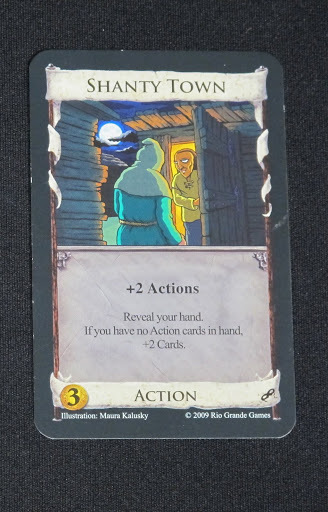 This card screams, “Combo with me!” Shanty Town’s presence on the board boosts many other cards, such as Conspirator. This set provides an incredible amount of good terminal actions, so Shanty Town will really take your deck to the next level. Of course many times you will not draw off of the first Shanty Town. Who cares? No real loss when you now can play two Torturers. The next card on the list can even help set up Shanty Town’s additional bonus. This card will benefit every player. In decks without multiple actions, it allows you to put a terminal action card on top for next turn instead of discarding it with no effect. In Shanty Town combo decks you can set up what you need. Courtyard digs three cards deep to find more actions if you already earned extra actions. You want to find these powerful actions as soon as possible and Courtyard makes that happen. 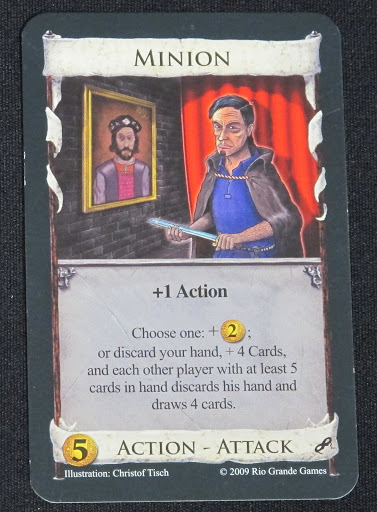 A great complement to any deck considering four of the top five game warping cards for an Intrigue game include terminal actions. Swindling first will put you far ahead of your competition. It enables better purchasing power and probably floods your opponents’ decks with Curses. Although many cards in Intrigue minimizing the effect of Curses, Swindler does not need to hit a Copper in order to do damage. Sometimes taking away a player’s Torturer to give him or her a Duke will solidify your lead. Only one other attack card surpasses Swindler on this list, but first you must remember the most powerful ability when playing Dominion. Trashing cards out of your deck enables all degenerate decks and combos. No other effect with accelerate your deck’s power level like removing the lower quality cards. Trading Post removes two bad cards from your deck and allows you to acquire a good card, not to forget the fact that this does not count as your buy for the turn. With one play you can trash two Coppers, gain a Silver, and buy a Swindler. Not bad. Trading Post diminishes the power of cards like Torturer and next card on the list. It sends a bad card to your neighbor. It draws you cards. It trashes. Enough said. It creates another reason why Torturer does not make the top five cards. Masquerade even competes with Courtyard’s ability to smooth out your draw. 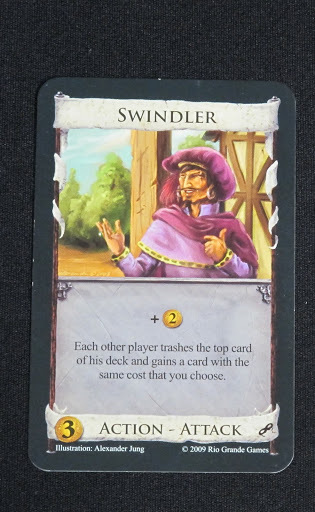 Masquerade changes every game it appears because even a card like Swindler now does not do as much damage. Masquerade still cannot protect you from one attack card. Ever play against a Minion deck before? If you said yes, did you want to kill yourself after watching your opponent destroy your hand and proceed to play four more copies of this card? If you said yes then you know you need to pilot the Minion deck as oppose to feel its wrath. No other card self combos as well as this attack. You play several copies for money and then use your last copy to refill your hand. Look out for cards like Mining Village and Bridge because they synergize well with Minion. Most Minion decks need trashing to reach crazy levels of power. Nothing trashes better than this card. At a cost of three, you do not fall behind when someone opens with five Copper and beats everyone to Trading Post. Trashing two cards at a time helps fight any player distributing Curses. After you finish trashing all the bad cards, it still provides a relevant effect of either drawing cards or giving you two dollars. You need to build a deck around this card every time it hits the board. What cards do you love to add to your Steward decks? 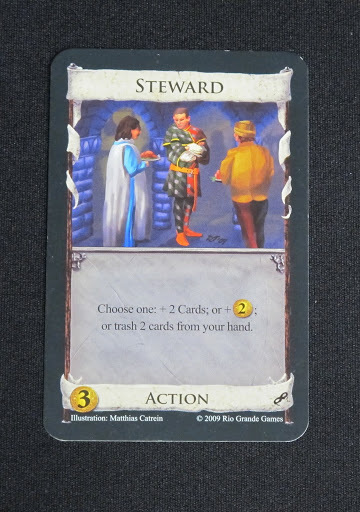 Do you think you would build a different strategy if Steward appeared on the table? 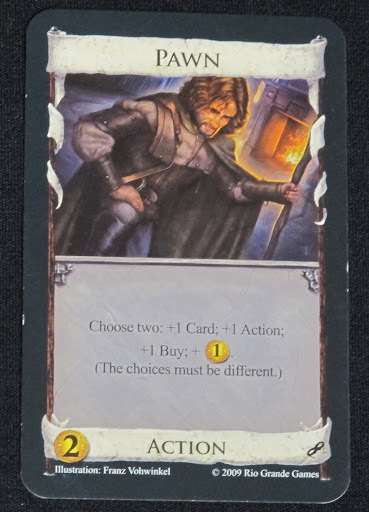 What other cards shine when playing with only Intrigue cards? Do you think a Duke strategy can work or will most players race for Provinces? **Special Thanks to Vishu Doshi for his input on this list. For more information about Intrigue check the product page on BoardGameGeek.com. Interested in purchasing a copy of Intrigue? Try the following links.